Laurine's roots for her love of house music go very deep, stretching back to her youth which was stirred by a strong fascination with US House and Techno music, which at the time had invaded the European club scene, bringing in a new underground subculture and at the same time exposing Laurine to the possibilities of a life as a DJ, through the discovery of emotion and energy being transmitted between the DJ, the records and the dance floor. Armed with an old mixer given by a friend and two turntables, Laurine became a regular at her two local records stores, this is before laptops and internet at home, but this is how music should be experienced, relying only on her ears and her instincts while she began collecting her first records. This thirst for recreating that vibe she often had experienced on the other side of the booth would become the catalyst to begin Dj'ing after she decided to leave her hometown in Italy for the warm city lights of Barcelona. Leaving the politics behind she was able to find a new freedom in the Catalan capital, working the circuit as a warm up DJ and learning the all valuable lesson of how to build a party from the beginning, thus creating the way for the next artist who arrives to a ready and wanting audience. Armed with this new knowledge she moved over to London where a meeting with DJ Tree firmly engrossed her into the culture of vinyl crate digging, seeking new in the old or finding a rare. 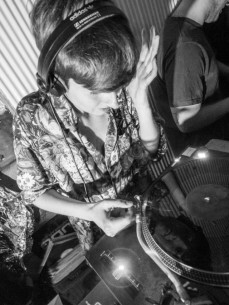 This missing link completed that full DJ experience and philosophy she had sought since discovering it the first time on the dancefloor. The next big change and perhaps the most significant was made in Berlin, where a chance meetings with fellow artists Cecilio and S.Moreira brought about the first ideas and discussions for forming a collective group based around a strong musical vibe with a quality sound and energy. The proof was ever made present when together they hosted a Slow Life showcase at the infamous Club de Visionaere to great success, the potential was realized and Slow Life became the vehicle behind their concept.